In episode seven of Fox’s Lucifer, the retired Lord of Hell shadowed Detective Dan (aka Detective Douche) in an attempt to discover how to be a better human being. The unlikely pairing of Lucifer (Tom Ellis) and Dan (Kevin Alejandro) kicked off a bromance that hopefully will continue to grow over the remainder of season two. 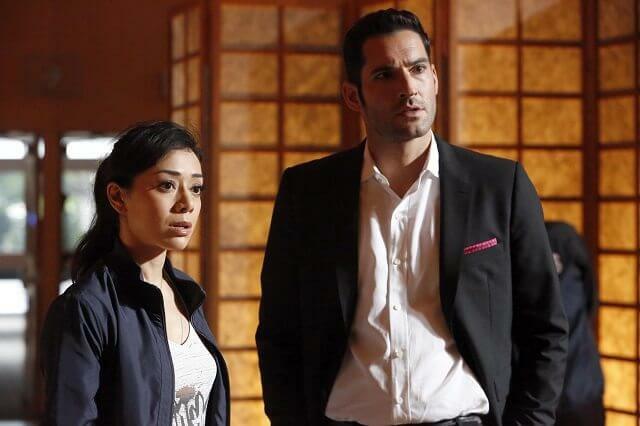 And coming up in episode eight, Lucifer has a new partner in crime-fighting when he teams up with Ella (Aimee Garcia). Episode eight titled ‘Trip to Stabby Town’ will air on November 14, 2016 at 9pm ET/PT. The cast of Lucifer season two includes Tom Ellis as Lucifer, Lauren German as Chloe, DB Woodside as Amenadiel, Lesley-Ann Brandt as Maze, Kevin Alejandro as Dan, Scarlett Estevez as Trixie, Rachael Harris as Linda Martin, Tricia Helfer as Charlotte, and Aimee Garcia as Ella. Episode eight’s guest stars include Andrea Bogart as Corrina Huff and Ryan Alosio as Jenson Glory/Jamie Ostrowski. The Trip to Stabby Town Plot: After discovering that Azrael’s blade has been stolen by a human, Lucifer quickly connects it with a string of violent stabbings revolving around a local yoga studio. While Chloe investigates the murders, Lucifer enlists Ella’s help in locating the sword to stop the carnage in the all-new “Trip to Stabby Town” episode. Lucifer Series Details: Lucifer is the story of the original fallen angel. Bored and unhappy as the Lord of Hell, he has abandoned his throne and retired to L.A., where he has teamed up with an LAPD detective to take down criminals.